I have turned one of the best summer salads into the absolute best summer pasta salad! 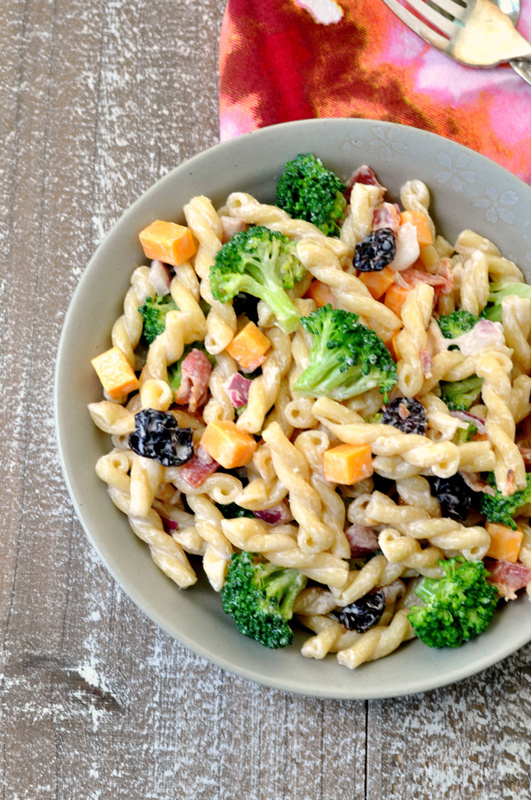 This Creamy Broccoli Pasta Salad is total perfection, you will be making it all summer long! 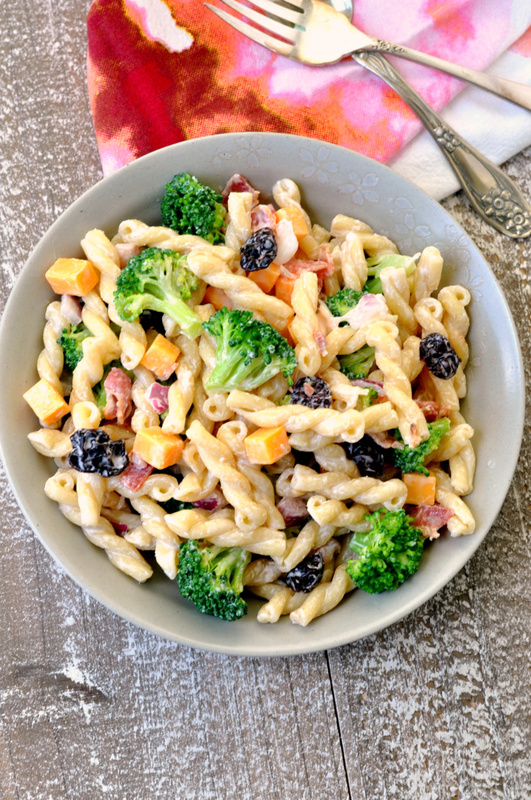 Creamy Broccoli Pasta Salad is made from gemelli pasta, broccoli florets, red onion, cheddar cheese, crumbled bacon, and dried cherries! A few years ago, a friend of mine introduced me to broccoli salad. I don’t know how I lived my entire life without every tasting it but I was hooked immediately. I still make it all the time but, now, I also make a Creamy Broccoli Pasta Salad to change things up a bit. This Creamy Broccoli Pasta Salad has all the best things about broccoli salad plus delicious al dente pasta. I also substituted dried cherries for the typical cranberries just to change things up a little bit more (oh and it was what I happened to have in the pantry). 1. In a small bowl, whisk together Greek yogurt, mayonnaise, sugar, honey and red wine vinegar. Season with salt and pepper. Set aside. 2. 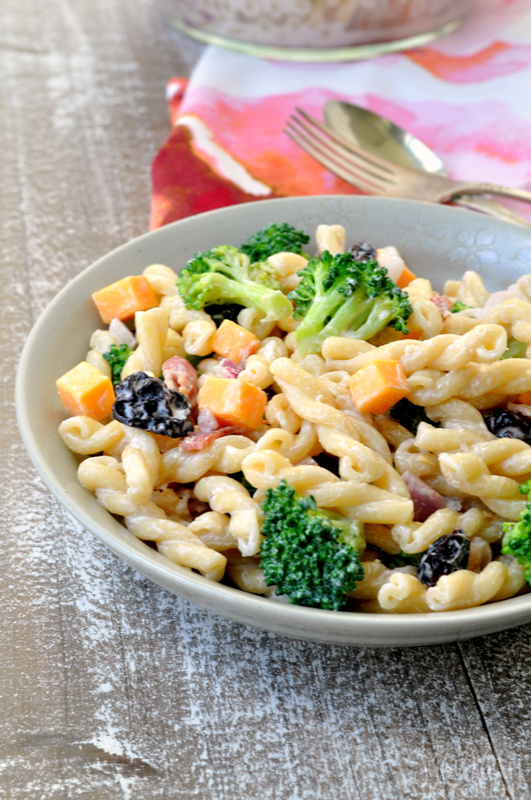 In a large bowl, combine pasta, broccoli, red onion, bacon, cheese, and cherries. Add dressing and stir to combine. Refrigerate until ready to serve. I really like the little bit of tang the Greek yogurt adds to the dressing. You can either switch out some of the yogurt for more mayonnaise or add in more sugar if you want it to be less tangy. Sometimes, I toss my broccoli into the pasta water for 1-2 minutes and then put it in an ice bath to blanch it. I think it gives it a beautiful green color and softens it just a touch for a better flavor. That step is totally optional though. What are your favorite summer picnic salads? Are you a big fan of traditional broccoli salad? In a small bowl, whisk together Greek yogurt, mayonnaise, sugar, honey and red wine vinegar. Season with salt and pepper. Set aside. 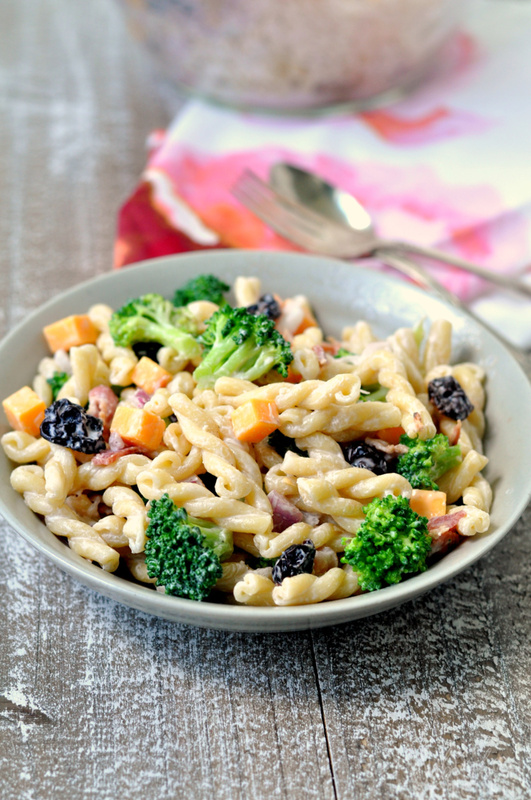 In a large bowl, combine pasta, broccoli, red onion, bacon, cheese, and cherries. Add dressing and stir to combine. Refrigerate until ready to serve.